Opiates are considered one of the hardest drugs to detox from due to the physical and mental withdrawals associated with long term use. In the past those who did not choose to detox cold turkey would turn to methadone, an opioid that is highly addictive and has its own problems when it comes time to stop taking the drug. Many people end up taking the drug for a number of years on what is called methadone maintenance. Essentially they traded one addictive drug for another somewhat cleaner drug with the same side-effects. Today, many opiate addicts turn to Suboxone (buprenorphine) to detox from heroin or other opiate based drugs like oxycodone. Suboxone has a great track record and has proven to be more effective than methadone when it comes to working a program of recovery. However, while Suboxone is considered to be a better choice than methadone, it too has its own side-effects and can be dangerous if used improperly. Due to a number cases of child poisoning makers of the drug have reformulated the medicine so that is safer. Accidental pediatric exposure with Suboxone tablets was 7.8 to 8.5 times greater than Suboxone film, according to the U.S. Poison Control Centers. 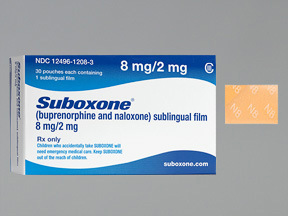 Starting in March, Suboxone (buprenorphine and naloxone), will no longer be available in tablet form. It will now be available in a film version of the medication, which is put under the tongue sublingually. At the recent New York Society of Addiction Medicine annual meeting, Dr. Edwin A. Salsitz, MD, the Medical Director of Office-Based Opioid Therapy at Beth Israel Medical Center, explained that the new formulation is less dangerous being more difficult for children to get into the film strip packages.